I’m sure I’ve said this before, but this is my new favourite thing I’ve made. It feels like a well-loved quilt in dress form. I’ve worn it for two days in a row. I’ve hung it on the wall to admire. I’d sleep in it if that wasn’t a bit weird. 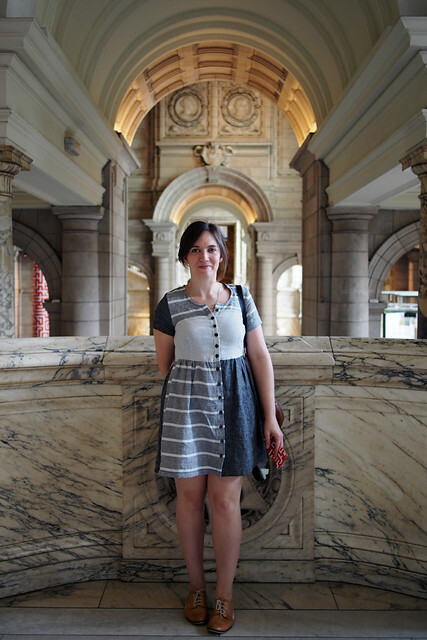 I even went and did a nice photoshoot for you at the beautiful Victoria and Albert Museum to show it off (well, I was there anyway with my sister to check out some Design Week goings-on and got her to snap these). This dress feels ever so London-appropriate. I like the feeling of blending into the grey pavements and buildings, or in this case the V&A’s stunning marble staircase. Blogger cliche red phonebox klaxon! At least I ignored my sister’s art direction request to pretend to speak into the receiver. London is having one final lovely warm snap, hence the bare legs. So the idea to patchwork a dress basically came out of necessity. On my trip to Merchant and Mills I was kind of plagued by indecision and foolishly bought all these short lengths of narrow linen and cotton, none actually enough for a garment. I kept petting them and placing them together and realised they’d probably blend nicely into a single garment. 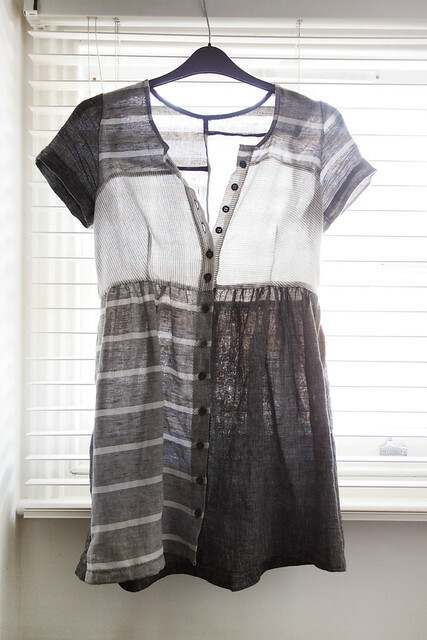 I was pretty inspired by this Rachel Comey dress and the clothing line Ace & Jig to take the plunge and go for it. The pattern I used is the Megan Nielsen Darling Ranges with a round neckline adjustment. This isn’t my first go at the DR, but I’ll chat more about it in another post coming up soon. Spoiler: I really like it and it fitted basically perfectly right off the pattern. I didn’t overthink the stripe/block placement too much, just tried to be a bit organic about it. I made panels roughly the same size as each bodice pattern piece, French seaming the pieces together before cutting out the pattern piece from it – easier than chopping up the pattern and adding seam allowances. I love the neckline binding on the DR, it’s done in a really nice way to get a clean finish around the placket. 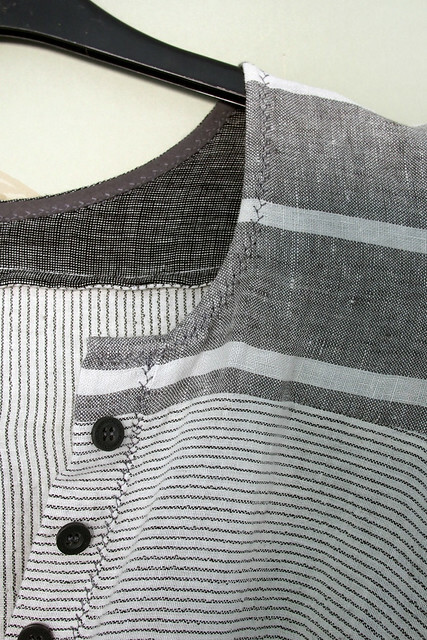 I decided on a whim to use one of the decorative stitches on my machine for the topstitching around the neck, down the button plackets and for the hem. The sleeves are cuffed on the outside, slipstitched invisibly down by hand. I think I like the back piecing better than the front – it’s a bit more random. 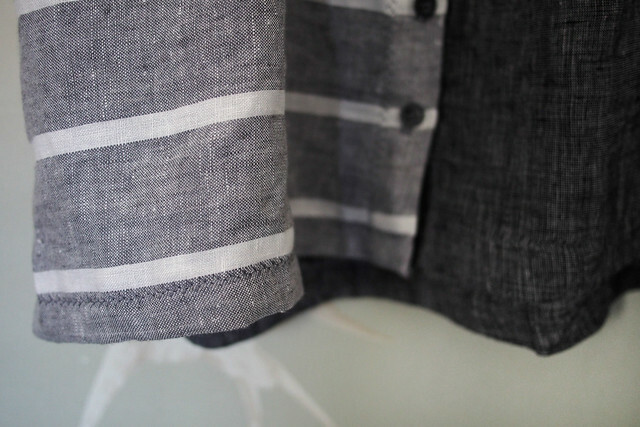 The grey and white stripe linen is probably the nicest fabric I’ve ever worked with: it feels like silk, I want a whole dress in it. I grabbed the very last 90cm that M&M had – it you spot it somewhere else pleeeease let me know. 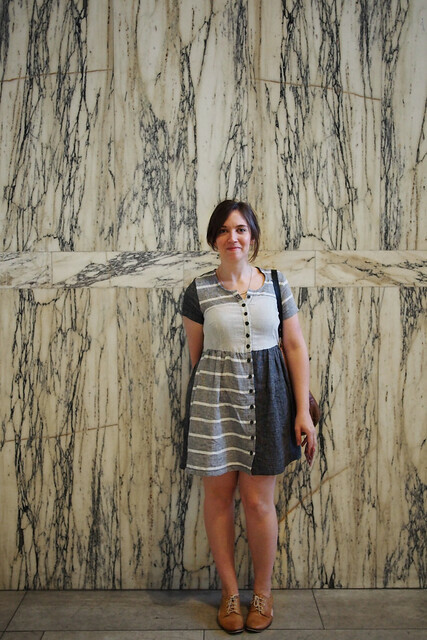 This dress was really, really enjoyable to make. It was a pretty slow sew in my terms: I took my time doing a little bit here and there almost like an actual quilt project. It’s all French seamed where possible and the remaining raw edges are overlocked. The fabrics feel quite delicate but I’m hoping it holds up to washing and wearing OK. Because I want to wear it all the time. 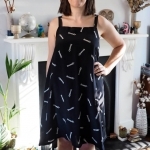 I’m so pleased with how this dress turned out; it’s all the more special because it’s unrepeatable and it actually looks hand-made – but in a good way, I think/hope! An interesting thing I’m finding lately in my sewing is that I’m becoming less interested in emulating ready to wear garments and more into making things that you can’t find in rtw – hand-dyed textiles, fabric piecing, self-drafting, luxury fabrics that would otherwise be out of budget. Perhaps that’s a natural evolution? I’m also chucking it into this month’s Sewcialists theme, Scraptember, led by Morgan. 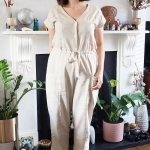 I’d definitely have a go at piecing a garment from scraps again – such a good way to use up those sub-1m bits you can’t bear to chuck away. Love this! The fabric combo is great! I love it! Those fabrics are all so very you, and they go together perfectly! I especially love the balance you’ve created by making the right sleeve and the left front skirt piece out of the same dark fabric. And I totally agree with you: Making things you can’t find in RTW is so much more fun than emulating things you can find! Thanks! I actually had the skirt upside down at first, but realised it was much more balanced with the dark side opposite to the sleeve, so I unpicked it and I’m glad you noticed! Fabulous. Didn’t expect to like this but it’s amazing – and beautifully made. Way to scrap, Katie! I like how the button placket divides the different fabrics and the unified color palette. is so satisfying. What a fun dress! I have to admit that the word “patchwork” gives me pause, but this is a very modern, fashionable take on the idea. Well done! Yeah I was worried it’d go a bit craftsy art teacher, but I think the colour palette helped avoid that. Fantastic dress. Definitely reminds me of Ace & Jig – in the best possible way! 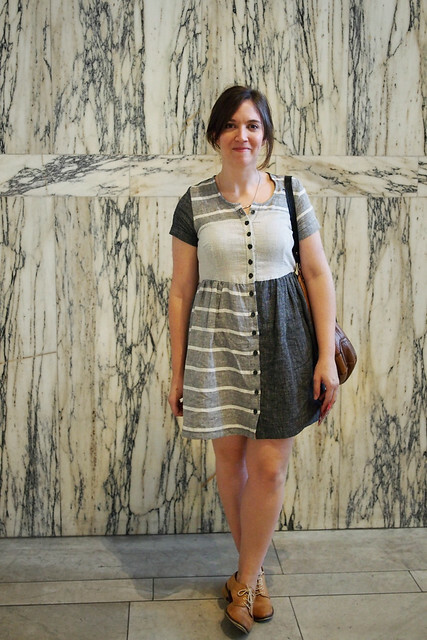 I’ve been pinning ideas for a mixed fabric dress and yours is at the top of my inspiration now. Super inspiring! Your face shows how much you love this dress. The patch working looks great. You did a lovely job! Sweet! I would never think to use lots of little pieces. It looks most Anthropologie. Ah well, that would have saved me some time! Yeahp I see Anthro in there too. what an amazing dress! i love the fabrics and the way you combined them, and the fact it’s made out of scraps makes it even more special.. i love bying scraps of fabric or demaged fabrics, i almost always feel like i’m ‘saving’ them, and try to make something real special out of them.. and, you’re glowing in these pics, i can see that you really enjoy wearing this dress! Ah, glowing, that’s such a nice thing to say! Yes I love to use every last scrap of precious fabrics too, even if just for a pocket lining! It looks great! I love the idea of piecing together a dress out of scraps – sadly I don’t think my scraps would produce anything this stylish though! This looks fab, what a great use of colour and pattern. I wish I had all these fabrics in my stash! Katie, I love it! How inspiring! I’m always so inspired by your fabric choices, and this dress you made is just another great outcome of your great fabric choices, being really consistent of the color and the feel which fit really well together. 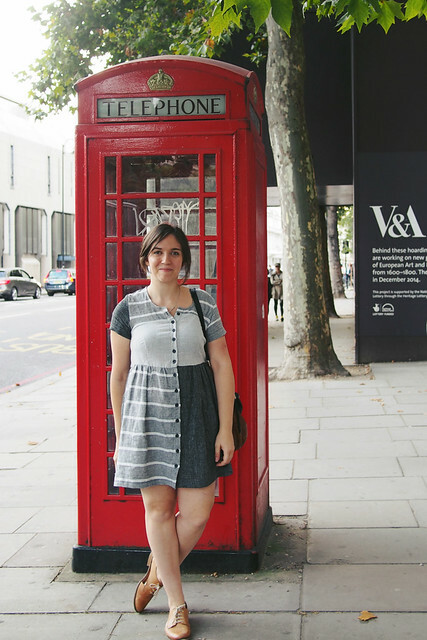 By the way, V&A was my favorite this sumner when I had a chance to visit London for the first time! It’s wonderful! Really so special. 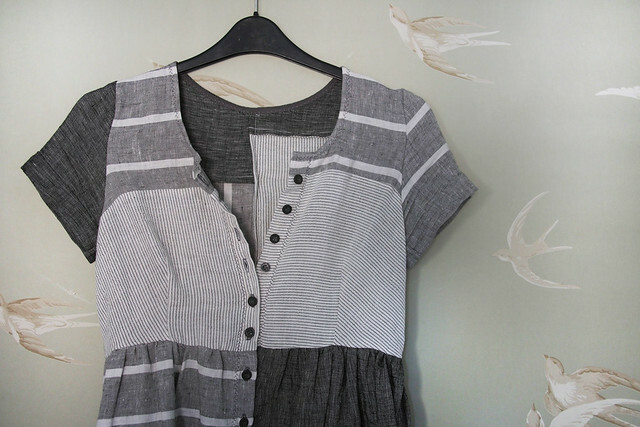 I love the piecing, the fun topstitching, the gorgeous array of greys. I’m very interested in what you say about evolving toward making things that can’t be found in ready to wear. It’s really very inspiring. Thank you, makes me happy to hear you find it inspiring. Love what you did with the decorative stitch on the binding! Super! I’ve been wanting to try the darling dress for ages, I think I’m gonna love it. When you were in the shop that day I held that lovely stripe in my hand and thought shall I buy this or remnant it?! 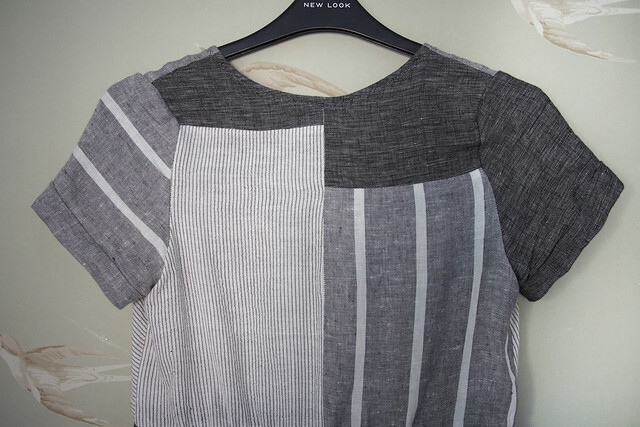 The gondolier stripe is exactly the same fabric but reverse colour way btw. The Lu Flux/Hazel Stark collaboration is a nice use of patchwork clothes too. The remnant gods (ie you) were shining on me! I’m dreaming of one in all the blue shades of block printed cotton now, hmmmm. Nice reference too, thank you. This is unbelievably gorgeous! I think you’re right about emulating rtw pieces too. Often I try to make my clothes as close to rtw as possible in terms of design and construction, but what’s the point in doing that? Why not celebrate handmade individuality? I’m definitely going to rethink some of my approaches to dressmaking now. I was doing that for a bit too and started to realise it’s a bit silly – though still useful to get to know your tastes and practice technique before going a bit more freestyle I reckon. 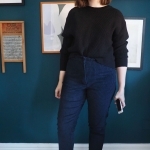 I like both – I’m making boring jeans again now! 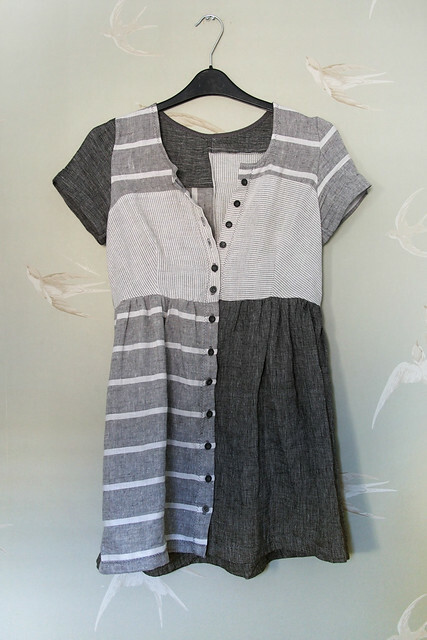 Rachel Comey and Ace&Jig, drool! Basically my favourite designers. You’ve captured both perfectly in this dress, I love the colours and the patchwork quality. I used to sew in a similar kind of way, with lots of contrasting fabrics, but mine always looked a bit too ‘crafty’ if you know what I mean! You’ve totally side stepped the pit of crafty-ness and come up with something so sophisticated. Inspiring! Thank you! I think patchwork clothing can easily veer into craftsy, I think you need to be careful with fabric and finishing selections to avoid that. What a great idea, love the result! 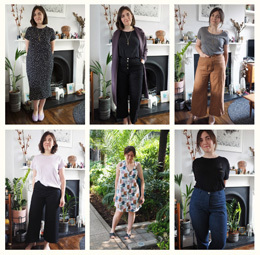 Am with you on wanting to sew one of a kind pieces and clothes that would otherwise be out of budget (although I’ve got a bit of a way to go until my skills match my ambition!). Wow Katie…this dress is inspired! Hard to believe it is hand-made it really is so chic and gourmet! It really looks like a one-of-a-kind ridiculously expensive boutique-dress :) You’re very creative! Oh I love this dress, those fabrics looks so great all together and this is such a great idea for left overs. I don’t think it looks handmade at all, it’s the sort of dress I’d admire and wouldn’t bother asking where it was from becasue I’d assume I couldnt afford it! This dress is all kinds of awesome! The fabrics work so perfectly together and the muted tone is fabulous. I need a dress like this! Such a brilliant choice of fabric. Loving this so much. More more more! I love this so much (I think we both have an affinity for Ace & Jig)! Looks a little like something I have cookin’! :) The back is absolutely perfect. Beautiful and one of a kind! It’s official I love your dress! it is fabulous, the piecing together of the scraps looks totally designed. Amazing work! It looks great Katie – and I love how you’ve created your own piece of fabric by combining smaller pieces! 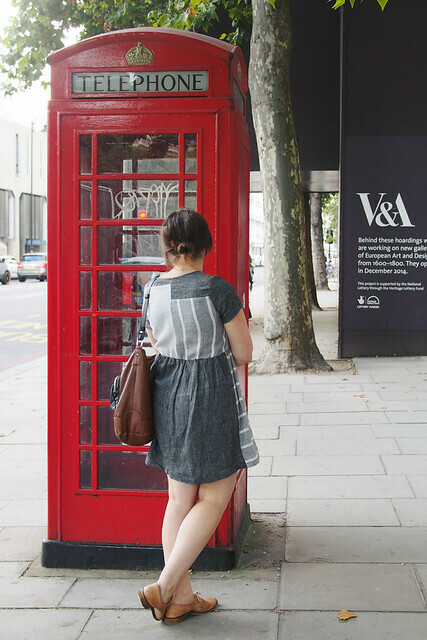 What a fun project…and I love the red phone box shot (I have the classic tourist shot of me “on the phone” in the red phone booth. LOL. Wow! I’m a new follower of yours, and this is the boldest thing I’ve seen you sew! It’s definitely something you have to look at, and I love that you ‘went there’ — definitely a favorite make by you. oh my, this dress is amazing! You Did such a good job of mixing up the patterns. I want one just like it, I am going to have to pull all fabrics out this weekend and see if any of them go together!